As we get closer to the release date for Blue Moon Vegetarian and things get not only more exciting but a little tense and nerve wracking, I am finding that the most satisfying part of the whole experience is having other people testing our recipes, showering us with praise, and then sending a photograph of the dish they made. So far, it’s been people we know or with whom we are acquainted (my publisher’s staff included) who have shared their results, but in the weeks to come, anyone who cooks up one of the recipes, photographs it, and emails it to me not only will be featured on a blog post, but will receive a thank you gift in the mail direct from Phil and me! And while it may appear that today we are featuring yet another Blue Moon Vegetarian Tex-Mex recipe, that’s not the case at all. It’s more like Mex-Asian: a fusion. I bet your mother never told you you could put stir-fry in a burrito, now did she? In a large skillet over medium heat, mash, stir, and cook beans, garlic, jalapenos, and onion. 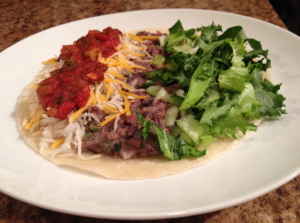 Layer beans and rice in flat tortillas with small portions of remaining ingredients. Fold over ends and roll into burritos. Serves six.